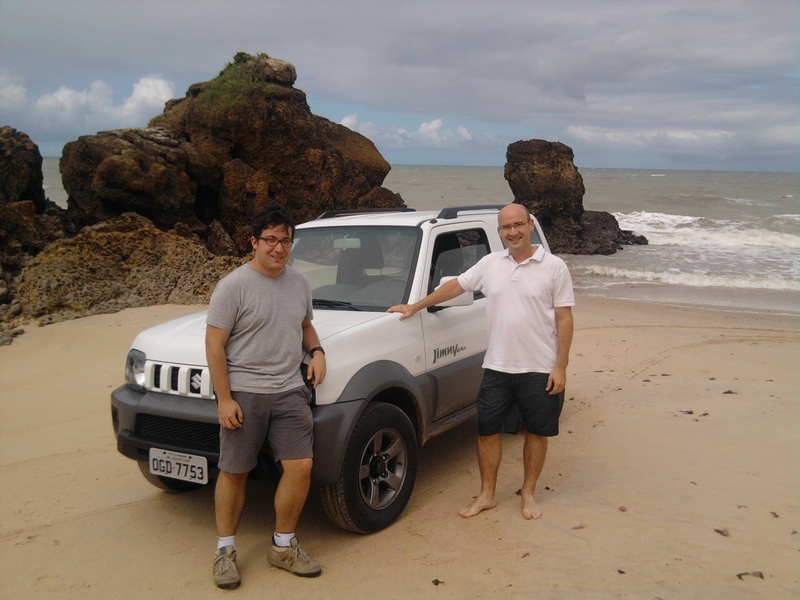 Diego Rubiera-Garcia (left, Lisbon University) and Gonzalo J. Olmo (right, University of Valencia – CSIC) after crossing a wormhole that connects Europe with the beaches of the Brazilian Northeast. According to Einstein’s theory of general relativity (GR), black holes are ferocious beasts able to swallow and destroy everything within their reach. Their strong gravitational pull deforms the space-time causal structure in such a way that nothing can get out of them once their event horizon is crossed. The fate of those incautious observers curious enough to cross this border is to suffer a painful spaghettification process due to the strong tidal forces before being destroyed at the center of the black hole. 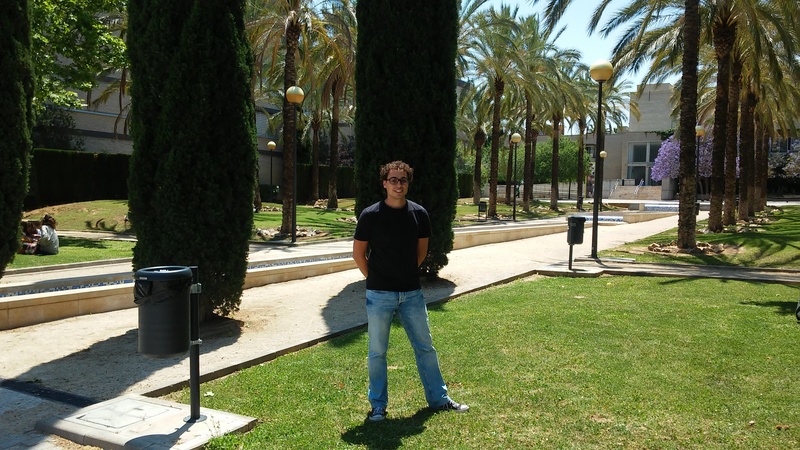 Antonio Sanchez-Puente (University of Valencia – CSIC) enjoying a sunny day in Valencia after submitting yet another postdoc application. For a theoretical physicist, the suffering of observers is admissible (one might even consider it part of an experimentalist’s job) but their total destruction is not. The destruction of observers (and light signals) is determined by the fact that the affine parameter of their word-line (its geodesic) stops at the center of the black hole. Their clocks no longer tick and, therefore, there is no way for them to exchange or acquire new information. This implies the breakdown of the predictability of the laws of physics because physical measurements are no longer possible at that point. For this reason, when a space-time has incomplete geodesics — word-lines whose affine parameter does not cover the whole real line — we say that it is singular. In order to overcome the conceptual problems raised by singularities, a careful analysis of what causes the destruction of observers is necessary. Our intuition may get satisfied by blaming the enormous tidal forces near the center, but the problem is much subtler. This is precisely what we explore in our paper. We study the impact of curvature divergences on observers that jump into a particular family of electrically charged black holes. These black holes were discovered in certain extensions of Einstein’s gravity considered in previous papers and have in common an interesting feature: their center is not a point but a spherical hypersurface of nonzero area. Trying to understand the properties of this new structure, we studied the behavior of the metric and the curvature around it and observed that generically they blow up there, except when the charge-to-mass ratio takes a particular numerical value. In that case, the divergences disappear yielding a completely smooth geometry with large but finite tidal forces. As a result, observer’s trajectories can be naturally extended beyond that surface, which turns out to be the throat of a wormhole connecting two regions of a larger space-time. This implies that geodesic observers can go through the wormhole throat and get into a white hole region, which allows them to finally escape from the black hole. A practical consequence of the existence of a wormhole is that the resulting space-time is geodesically complete, which means that the clocks of geodesic (point-like) observers have been and will be clicking forever. This was obvious for the case without curvature divergences but not so much for all the others. After verifying this point explicitly for arbitrary values of the charge-to mass ratio [in a separate paper], we moved on to consider the impact of curvature divergences on physical observers with a finite volume, a better modeling of actual observers, which obviously are not point-like objects. This work, therefore, deals with the effects that an observer represented by a bunch of geodesics (technically, a congruence) experiences while crossing the wormhole. We find that as the wormhole is approached, observers suffer a radial stretching (spaghettification) identical to that observed in the usual Schwarzschild case. Though this (spatial) stretching diverges at the throat, it turns into a contraction when the wormhole is crossed. Our main finding is that, by analyzing the exchange of light signals between the elements of the congruence (constituents of the observer), we verify that they keep in causal contact as the wormhole is crossed. In other words, the time a light ray takes in a round trip between any two nearby geodesics is always finite and causal despite the infinite (spatial) stretching caused by the unbounded tidal forces. This puts forward that the infinite (spatial) stretching is not physically observable and that finite forces mediated by the exchange of photons could hold the different parts of the observer together. Thus our observer could get swallowed into the black hole, cross the wormhole throat, exit through the other side, and live to tell it regardless of the existence of infinite tidal forces. Summarizing, curvature divergences are not responsible for space-time singularities and black holes need not be synonymous with death. The emergence of wormholes and new physics beyond Einstein’s gravity may help solve longstanding puzzles and bring a happy ending to an otherwise horror story. This entry was posted in Author Insights, IOPselect and tagged black holes, spacetime, wormholes by Jennifer Sanders. Bookmark the permalink. Pingback: Spacecraft could Potentially Survive a Black Hole Shortcut Across the Universe | New Fox | Index today's latest news on events, accidents, crime, law, unique news, Politics, and special coverage internationally. Pingback: Black Holes Could Open Portals to Different Universes, Physicists Determine - Czaal is a source for deep thinkers, lifelong learners and truth seekers. Posts on science, self-improvement, psychology, unexplained mysteries.